Ok, so, I’m on toddler number 5 at my house. This one is an adorable little red-head who is sweet and cute and cuddly until you try to interfere after she has said those fatal words, “I do it.” Then she turns into this little raging lunatic who cannot be reasoned with despite my most diplomatic efforts to bring her to my way of thinking. Sound familiar? Toddlerhood is one of the most adorable, fun, and trying times of a our lives as parents. I have a few toddler tantrum tips to share that I hope will help you enjoy this stage more and keep some of your hair connected to your scalp. Read on. Tip #1- End the battle before it begins. Once you engage in a power struggle with your toddler, you feel like to be a good parent, you can’t let the child win or you will teach them that when they behave badly, they get what they want. It is a tough spot to be in, so a better plan would be to avoid being in that spot in the first place. Before you take the power struggle route, ask yourself: is it really important that my child does this my way and not their way in this instance? If I let them do what they want to do in this instance, is it teaching them bad behavior or is it just annoying to me because my way is faster, easier or more convenient? Am I just doing this because I want them to know I am in control or I want to feel like I am in control? Because I assure you, you never feel less in control than when you try to assert your power over you child and you are unsuccessful. Response #1: After letting her try for a bit, I wrestle with her until I finally get the shirt on that little body. This response is ineffective at preventing tantrums because she is screaming and squirming more than a steer being wrestled in a rodeo, exhausting both of us, and as soon as I let her go once the shirt is on, she promptly rips it off in defiance. In this response, I chose to do battle with my two-year-old and guess who won in the end? Response #2: She picks up her shirt and says, “I do it.” I recognize this a cue from her that being able to put on her own shirt is important to her as she is trying to develop her independence, so I step back and let her try. Hopefully, we are not in a hurry to get anywhere at this point. There are two possibilities for what will happen next. Eventually, she will get so frustrated with her inability to put on the shirt that she will come to me for help, or she will run around without a shirt for a while. I can handle both of these options and so I choose to end this battle before it begins and not try to interfere after she says, “I do it.” This prevents us from entering into a power struggle where I have to prove I am in charge and she doesn’t get what she wants when she behaves badly. Tip #2: An ounce of prevention is worth a pound of cure. This is so true when it comes to toddlers. 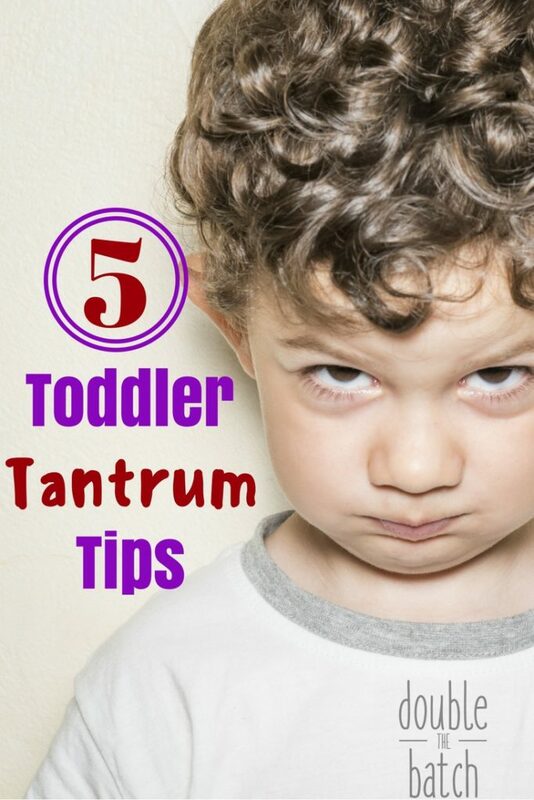 Just like you toddler-proof your house to prevent messes and life-threatening accidents, if you pay close attention to your toddlers cues and learn from past failed interactions, you can tantrum-proof your life for the most part over time with some effort. So, now I need to learn from this experience and prevent this power struggle from being a problem in the future. Ways I can do this might include making sure I try not to wait until the last minute to get her dressed before we need to go somewhere, knowing getting that shirt on might take some time. It might also include coming up with a distracting song or game that I do with her while getting her dressed that might distract her from noticing it is me putting her shirt on and not her. Coming up with creative and effective responses in advance will help you navigate those troubled toddler waters without sparking a tantrum next time that situation arises. -I take my daughter into the pantry in the morning to have her pick what cereal she wants to eat. She instead sees a box of crackers and asks for crackers over and over again instead of cereal. To avoid a power struggle, I let her have a cracker, but immediately find a new place to hide the crackers so tomorrow morning she won’t see them as an option. -There is a toy of my sons that my toddler loves to play with, but causes contention between them and a tantrum if he takes is away from her. So, I take that toy and put it up until the toddler is napping and then bring it down for my son to play with. Tip #3: Recognize the difference between tired, hungry, or just unreasonable. If your toddler is tired or hungry, they will usually make that pretty clear by their unreasonable response to anything and everything around them. This is not a time for discipline or power struggles. It is a time to fill their belly or get them to a bed. Don’t waste time or energy at this point doing anything else. Tip #4: Help them feel understood. One of the hardest things about this age is that they are beginning to communicate their needs and wants to you vocally, but their command of the English language is still quite lacking. It is so hard when they say something to you over and over and you have no idea what they are telling you. You know as an adult how frustrating it is to not feel understood. They feel the same way. Get down at eye level with them. Have them show you what they want if what they are saying just isn’t making sense. Do your best to figure out what they are saying and say it back to them so they know you are listening and understand. Tip #5: Give them you. So often, when a toddler is whiny or behaving badly, it is their way of saying- “hey, I need a little mom or dad time. I need to feel connected and important to you.” Life is hectic and busy and there is so much to do everyday, but just taking a break from your busy-ness and spending 15 minutes here and there throughout the day with your toddler will let them know they are loved and significant to you and often will prevent a lot of annoying behaviors. Finally, remember this is a stage that will be over before you know it. They will get older, better and communicating, and easier to reason with soon enough. Then you’ll have to change your way of handling their misbehavior. But, for now, distract and re-direct like crazy, prevent and avoid battles, and give them the time they need so much from you. You will survive and even enjoy this stage so much more by doing these simple things. For more ideas, check out this post I wrote when I was dealing with toddler number 4.